Although 95% of you already know what Jacks Valley is, I'll just give the "Webguy's Digest" version. Jacks Valley is a 3,300 acre training complex where the Basics will spend about 11 days of 2nd BCT. The location is the valley north of North Gate Boulevard. They go out there, pitch big tents, and camp out. What do they do out there? Remember when we were young and watched movies like Private Benjamin, Stripes, Officer and a Gentleman, etc? All of the running over obstacles; falling in the mud; crawling through dirt. That's it! 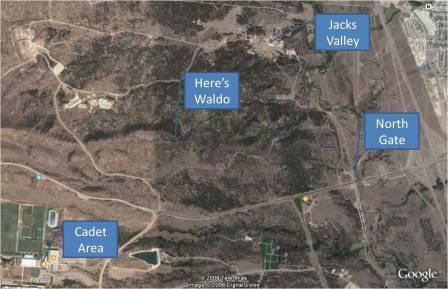 Below is a picture showing where Jacks Valley is in relation to the Cadet Area. Please note - if you are in town and are planning to come watch the march out, they will step off at 0730. They will be marching into Jacks through the West Gate, which means the best places to watch them will be either at the chapel wall or at the overlooks along Academy Drive. Do NOT wait at the B-52. They will not pass by the B-52 and you will not see them. Since the Basics march out on the road, they will be closing the road, so get here early before step off.